The smart home space remains the domain of the early adopter, but Apple's HomeKit market is more scattered than most. 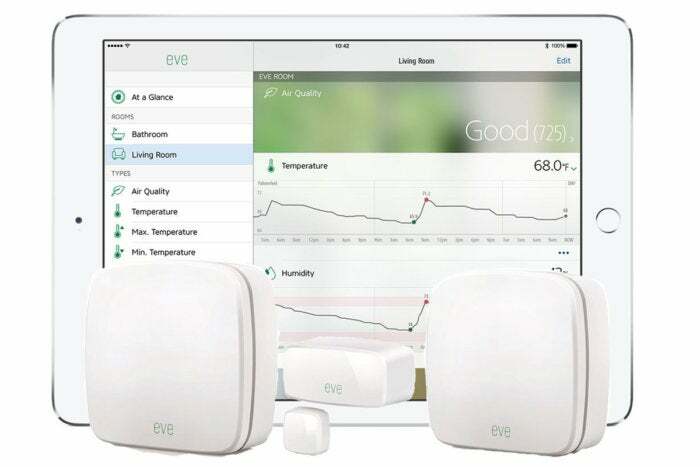 Apple announced its smart-home control system, HomeKit, in 2014 at its annual developers conference. It started enabling it in iOS in mid 2015 and had a more complete rollout later that year. With iOS 10 in September 2016, HomeKit finally got its own app and better integration. But HomeKit remains an immature technology with few choices even for diehard Apple equipment owners. This was emphasized at CES, a trade show at which Apple never exhibits, but where products from third parties aimed at the ecosystem often get their debut. For HomeKit, it was mostly crickets. Amazon’s Alexa ruled the roost, with a large number of integrations with third parties, extending its voice-controlled system. This is certainly part of a larger sense of malaise across all smart home systems. While the promise remains immense, multiple competing, incompatible ecosystems that include a lot of products from startup companies seem to have stalled a lot of innovation and even reductions in cost. 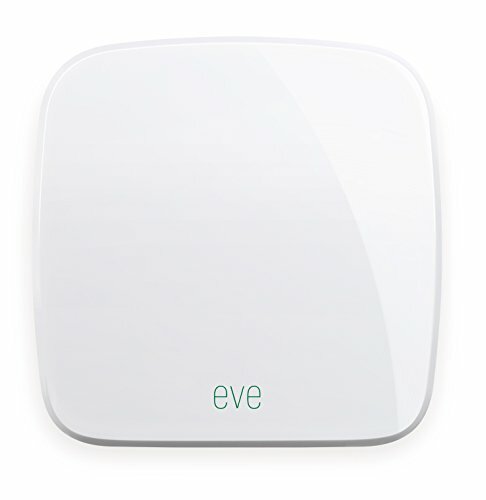 Elgato’s Eve is one of the earlier HomeKit systems. It includes door/window, motion, and environmental sensors. Imagine if instead of Wi-Fi, we had three separate high-speed local area wireless networking standards, and had to either set up a separate router for each and use dongles, or buy into an approach that wouldn’t work everywhere when we left the house. In that context, however, HomeKit still remains behind. While HomeKit is built into iOS and the fourth-generation Apple TV, which can act as a hub of sorts, macOS doesn’t include it. And third parties are making HomeKit-enabled hardware, but not enough and in enough variety that if you’re looking to equip your home with a single system, you have enough choices. This snapshot of the market will certainly change, but the lack of product announcements at CES means the likelihood is low through much of 2017 for established companies and well-funded newer firms to add significant HomeKit options. In case you’re not tuned in to the purpose of smart home devices, controls, and ecosystems, here’s a brief primer and where Apple’s HomeKit fits into things. Smart home devices are a subset of the internet of Things (IoT): network-connected equipment that can be used over a local network and accessed remotely via the internet. Some smart home gear is also connected to the cloud. Having very little computational intelligence of its own, these devices rely on internet-connected servers for cues or control. Behmor’s connected coffeemaker is like many smart appliances: You can control it with your smartphone via your Wi-Fi network, but it can’t be integrated into a broader smart-home ecosystem. The smart home promise is to bring intelligence to “dumb” gear for reasons of convenience, energy efficiency, safety, and even fun. Lighting is the main example: few people wired-in intelligent lighting controls in homes prior to the development of network-connected light switches and bulbs. Nor would most people consider being able to unlock their front door remotely an important feature, or having remote-controlled blinds. These would have been largely expensive and custom installations. Smart home products aren’t cheap, but they’re often amenable to user installation and are nowhere as expensive as the previous generation of automated goods. You might also want to read about Fibaro's HomeKit sensor lineup. The goal of a smart home is to take hundreds of small decisions and behaviors and wrap them up so you can trigger them based on time, presence (judging via sensors or smartphone proximity), or patterns. So you might set what Apple calls a “scene” that you use for your whole family being home in the evening. Another scene might power up a home-entertainment system, dim the lights, lower the blinds, and even roll down a screen or retract a covering. Unlike some other computer and personal electronics standards for device communication, no single industry group emerged to bring all the disparate manufacturers into one flexible standard, as with Wi-Fi, USB, Bluetooth, and others. As a result, you can find dozens upon dozens of protocols that work at various levels of networking function. Smart home ecosystems are typically built on existing networking standards, providing compatibility at that level at least. This can include the well-known Wi-Fi and Bluetooth, but also ones you are unlikely to have heard of if you haven’t already installed gear, such as Thread, ZigBee, and Z-Wave. Why not just use Bluetooth and Wi-Fi-enabled IoT smart home devices, some of which have been around out for years? Because those typically require buying all your equipment from a single company, and relying on it to advance hardware and software on its own. These newer ecosystems may have a single firm dominating them, like Apple or Google, but ultimately hundreds or thousands of companies will make products that work with them, although some companies may have to make multiple versions. And a coalescing of approaches has started to happen, which will decrease incompatibility and reduce your need to buy in to one system. The recently formed Open Connectivity Foundation comes out of a merger of groups backed separately by chipmaker Qualcomm and CPU giant Intel. As IDG News Service correspondent Stephen Lawson wrote after the 2017 CES, however, it will likely be one to three years before the industry begins to coalesce around a few standards that provide better interoperability. You may have read some of the coverage in late 2016 about IoT botnets, which are smart devices that have had their software and capabilities hijacked, usually undetectably by their owners, and which are then used to launch distributed denial of service (DDoS) attacks against targets for financial or political reasons. The IoT devices identified as the biggest problem are typically one-off hardware that aren’t part of any ecosystem, and are typically sold inexpensively (and often under many different brand names) by low-end manufacturers. A map of the massive DDOS attack that occurred in October 2016 and the internet outages involved. Hardware that is certified for one of the major smart-home systems, like HomeKit, must demonstrate that it adheres to encryption and other standards. Apple is particularly rigorous on this front, including disabling remote access to HomeKit accessories by default. This may explain why HomeKit hardware has been slower to come to market, too, but it’s a good problem. It’s in this framework that Apple remains an island with HomeKit, its own standard that it licenses to other parties, but which doesn’t interoperate on its own with any other top-level standard, like Thread, a standard deeply supported by Alphabet’s Nest. HomeKit originally required using various smartphone apps and benefited from a third-party HomeKit hub to pull together connected actions. But Apple added a dedicated app, called Home, starting in iOS 10 and watchOS 2, which radically simplifies controlling HomeKit-equipped hardware. Home controls appear in iOS’s Control Center. 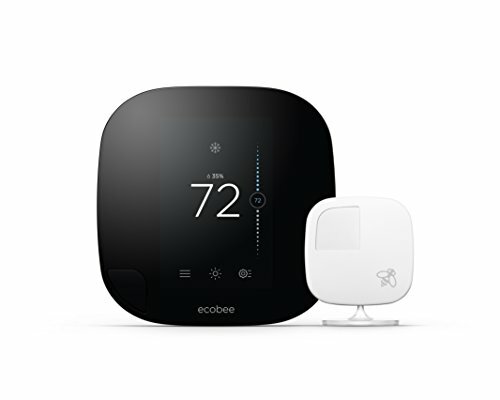 The closest comparison to the Home app for central control in other ecosystems is Google Home, an Amazon Echo-like device that connects to Nest and other supported hardware, and Samsung’s SmartThings, which works with several kinds of smart-home protocols, but not HomeKit. SmartThings has an Android and iOS app, and requires its own hub. 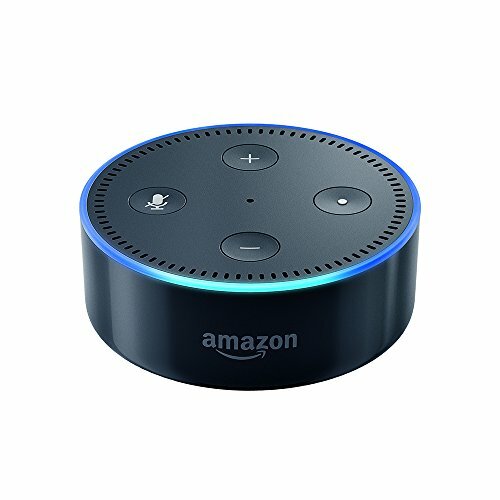 Amazon, meanwhile, is making fast progress when it comes to expanding the universe of smart devices that its Alexa digital assistant can control. 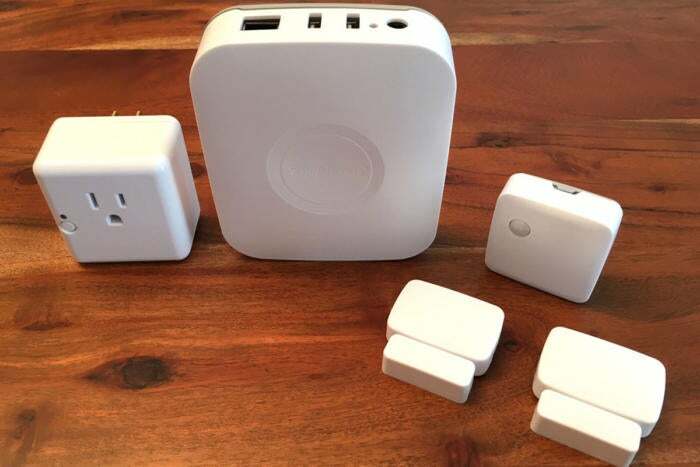 Samsung’s SmartThings hub, smart plug, door/window sensors, and a motion sensor. The hub has Z-Wave and ZigBee radios inside. Manual control works without a hub, but if you want to schedule events, set up user permissions to for specific hardware, and remotely control HomeKit devices, you’ll need one. 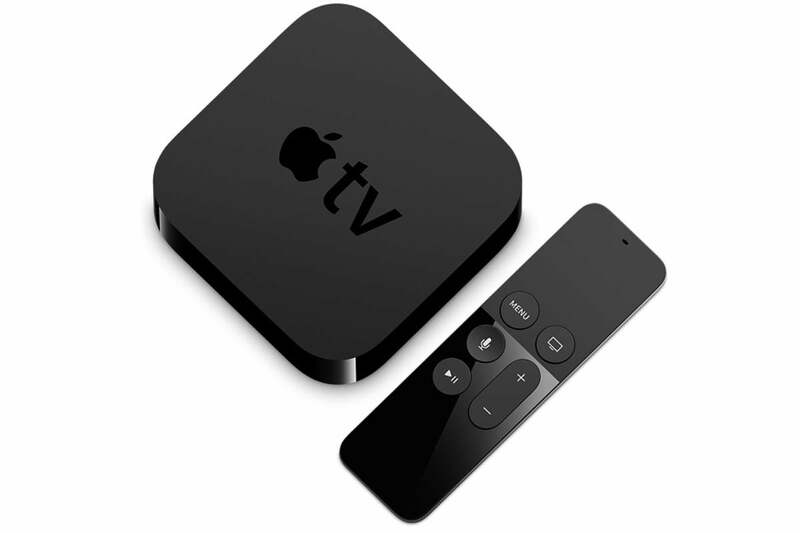 Remote control, including using Siri on an iPhone or iPad, requires either a third- or fourth-generation Apple TV. The Apple TV must logged into the same iCloud account. For timed actions and user permissions, you must have a fourth-generation Apple TV running tvOS 10 or an iPad with iOS 10 on your network. Many people seem to have iPads that routinely stay at home, making this latter option a reasonable choice for them. Having an Apple TV on your network will enable you to control HomeKit devices from afar. You can also use a third-party hub, which have various features and can bridge multiple standards. The Caséta Wireless Smart Bridge Pro works with products from its maker, as well as certain Nest, HomeKit, and other devices. The Insteon Hub offers the same automation and remote control options as tvOS 10, but can also control the broad universe of Insteon hardware. In the Home app, all available devices appear and can be assigned to locations, like rooms, and to scenes, which are collections of accessories paired with a state they should switch to, such as the lighting and temperature you’d like to trigger when you wake up and say “good morning” or at a certain time of the day. 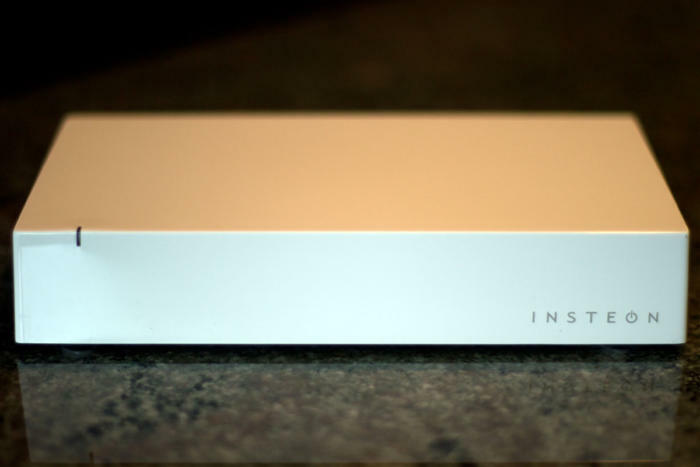 The Insteon Smart Hub Pro is a good choice for early adopters who also have Insteon products. 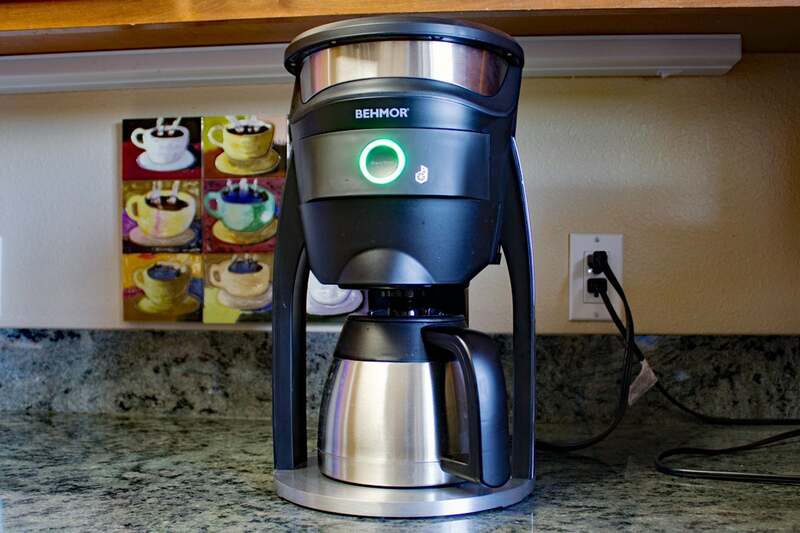 The company is one of the earliest players in the smart home market.